Toronto (Ontario), June 5, 2018 – BlueRush Inc. (“BlueRush” or the “Company”) (TSXV:BTV) is excited to announce One Touch Video Chat (OTVC) as a new strategic video chat platform partner. This new partnership creates a significant market impact in the Financial Services vertical for BlueRush in two meaningful ways. The first is the product synergy between the OTVC video chat platform and BlueRush’s Digital Reach Product. Together they provide a powerful platform for financial advisors to create a deeper connection with their clients further strengthening the advisor-client relationship. Second, the combination of BlueRush’s IndiVideo, which offers interactive personalized video marketing for the mortgage industry, with instant connections to video mortgage advisors from OTVC’s SaaS video chat platform for loan officers, creates a powerful call to action. The Company, through its wholly-owned subsidiary, offers a SaaS-based content engagement platform, called DigitalReach, which bridges marketing, sales, and compliance. Used by financial advisors, DigitalReach allows for the centralization, personalization, distribution, and tracking of content to ensure complete control over what is sent and to whom. BlueRush has also launched IndiVideo, the interactive personalized video platform for financial services. IndiVideo is a highly scalable personalized video platform built to provide AI-driven video content in an easy to understand, entertaining, and compelling manner. The Company’s products improve marketing and sales performance and generate greater client satisfaction and loyalty. The Company is publicly listed on the TSXV trading under the symbol “BTV”. One Touch Video Chat provides a SaaS-based video chat platform for companies to reach today’s digital customer. Their video chat solutions provide everything needed in the video chat journey from both the customer and company perspective. 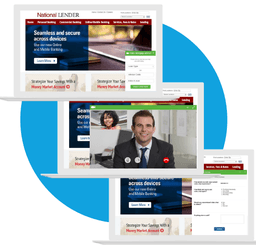 With no hardware or software required, clients can have their own branded video chat experience on their website or within their mobile apps in a matter of days. Nothing can replace the human connection, except a virtual one! 2017 One Touch Video Chat® | All Rights Reserved.